The other day in The Make It Happen Club I shared a live post with the club members about cognitive dissonance and diet culture. It struck a chord with a few of the members, so I thought I would share the message with you! In The 10 Minutes a Day Bootcamp, Janey had inspired us all with a fabulous audio about ditching the scales, which can be a big part of moving away from diet culture. But sometimes people find this a really hard concept to come to terms with, and I wanted to delve a little deeper in to why. Cognitive Dissonance: the state of having inconsistent thoughts, beliefs, or attitudes, especially as relating to behavioural decisions and attitude change. Take a watch if the quick video as it is so much easier to explain there! (Ignore the fact that I cannot say dissonance, and later resort to saying dissodance – which isn’t a word!). 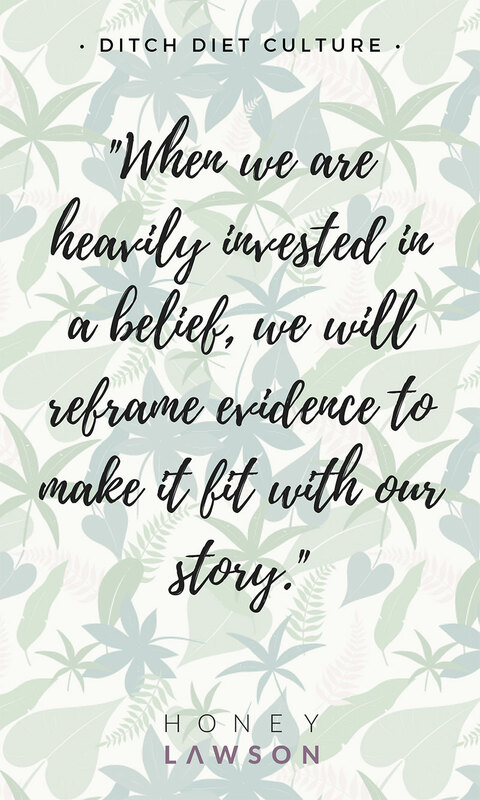 When we are heavily invested in a belief, we will reframe evidence to make it fit with our story. And sometimes, to everyone else this can seem absolutely ridiculous, but to us, we believe it to be the honest truth. Apply this to diet culture – when we follow the diet strictly, but our weight doesn’t change, do we blame the diet? NO! We blame ourselves, because of the inherent belief that the diet must work, and we must have done it wrong. Well how about believing this – diets don’t work! And why do we believe our value is based on how much we weigh? Because diet culture tells us to believe it. Yet surely we know this is stupid. Ridiculous. How can weight be any kind of marker of our worth as a human? But because it is such a normalised way of thinking, we accept it as the truth, adjusting reality to fit the story, rather than taking the real truth: we are so much more than our weight. Want to ditch the diet and move away from diet culture for good? I’ve recently completed training with Laura Thomas PhD in Intuitive Eating. I used to think I should actively want to be on a diet, but I knew it wasn’t right for me. I wondered what was different about me? Why didn’t I want to diet? How could I not feel guilt around giving myself unconditional permission to eat? What allowed me to feel happy with my body, whilst confidently accepting it wasn’t perfect? Turns out, I was just doing what I was born to do. Listen to my body, and eat intuitively. Do you want to eat intuitively too? Get in touch and join me for a FREE 30 minute Health History Exploration Call. Stop succumbing to diet culture, and give your mind and body more space to achieve your purpose. CLICK HERE TO GET A FREE TRIAL OF THE 10 MINUTES A DAY BOOTCAMP!